Rousseau's ideas have influenced almost every major political development of the last two hundred years, and are crucial to an understanding of phenomena as diverse as the French Revolution, modern educational theory, and the contemporary environmental movement. This is reason enough to draw attention to his startlingly alive autobiography. 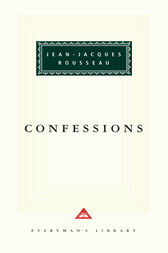 But the Confessions is also among the greatest self-portraits in world literature -which suggests, even more than the impact of Rousseau's thought, the extent to which the very high opinion he had of himself was ultimately justified. P.N. Furbank is Visiting Professor in Literature at the Open University and author of E. M. Forster: A Life. Other publications include Samuel Butler: 1835-1902, Italo Svevo: the Man and the Writer, Unholy Pleasures: the Idea of Social Class and (with W. R. Owens) The Canonisation of Daniel Defoe.